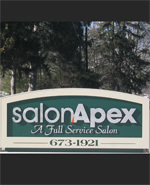 Salon Apex is a unique balance of creativity and artistry. A careful and complete blending of style and services that capture a sense of wellbeing for all our clients. We are a collection of individuals possessing kindred spirits and talents working together in this rare and beautiful setting and we are looking forward to meeting you. Our front desk staff are here to assist you in any way Tuesday - Friday from 9-5 and Saturdays from 9-1, or contact your technician via their individual emails available on staff page or general salon email address - salonapex110@gmail.com. We have gift certificates available for each of our staff members. If you need a gift certificate after front desk hours, call ahead to purchase & we will gladly have it ready for you to pick up at your convenience.